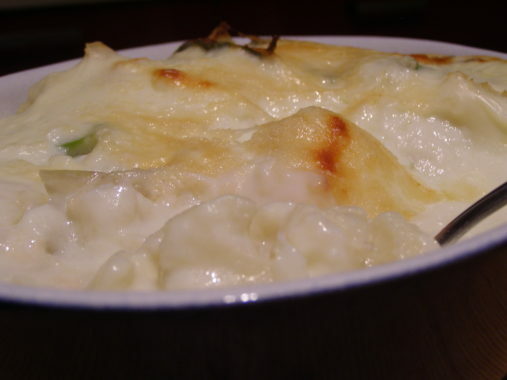 Baked cauliflower cheese with chives: Many years ago in the bars and restaurants of Britain, baked cauliflower cheese was considered ‘THE’ dish for vegetarians. It must have been one of the most popular vegetarian dishes of all time!Today we have come to embrace a varied choice vegetable dishes that we could consider the main part of the meal as well as the side. 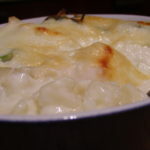 However, let’s not forget that baked cauliflower cheese is a classic! The addition of Philadelphia cheese truly helps give our particular recipe an improved texture to the sauce. This delicious dish of baked cauliflower cheese with chives could be thrown over a pile of pasta or used to top a cottage pie in favour of using mashed potatoes! Preheat the oven to 195 C / 375 F.
Cut the cauliflower into equal, bite sized pieces. Bring a large pot of water to a boil, add 1 teaspoon of salt. Add the cauliflower and cook until just tender enough that a fork will pass through will a little resistance. Meanwhile, prepare the sauce and melt the butter in a saucepan over a medium to low heat. In a jug, mix the cream with the cornflour. Constantly stirring with a whisk, pour the cream and cornflour mixture over the butter slowly. Add the bay leave and bring the sauce to a boil stirring constantly to avoid it burning. Lower the heat, cooking and stirring for a further 1 minute. Add the salt and cream cheese then stir to melt the cheese. Drain the vegetables and arrange them in a deep oven-proof dish. Top the sauce with the grated Cheddar cheese and sprinkle with the nutmeg. Cook in the centre of the oven for 30 minutes or until the sauce begins to brown on the top. Serve sprinkled with the fresh chives.